You’ve heard the old saying many times: Haul it in and haul it out. That generally applies to trash, but more places now require that visitors carry out their human waste as well. In some, you don’t have any choice. In the Moab, UT area and on the Rubicon Trail, for example, the ground is so rocky that it’s impossible to dig even a small hole. This is also true of some places in The High Lakes. 4-wheelers for the most part are good about cleaning up after themselves, but some still need guidance regarding the sensitive topic of going to the bathroom. This isn’t the most pleasant topic to discuss in public, but it is necessary. Too many of our trails and camping areas have literally become open-air outhouses. What’s really annoying is all the toilet paper lying around because the user didn’t take the time to bury it or put it in a plastic bag for disposal, or best of all carry it back out of the areas with them. Dealing with toilet time is challenging, no doubt about it. Some drivers have tried a portable toilet (often called a porta-potty). Those are fine if you’re on a flat, level surface or in an RV. In addition to their size, these units use liquids to treat the waste, making them impractical for 4-wheelers. 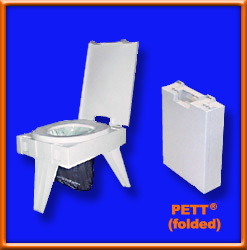 A better option is the PETT® toilet system. PETT uses a dry chemical, and provides plastic bags to catch and store the waste. It’s a pretty nifty system. A large bag, which contains the chemical, which is hung inside the toilet, is used during each trip to the toilet. That bag is sealed and dropped into a smaller bag. At the end of your trip you simply dispose of all the bags in a trash receptacle. The PETT System renders the waste bio-safe for disposal in any dumpsters or garbage collection point. You can choose from 12-, 50- and 100-pack waste kits. All kits include toilet paper and hand sanitizer. 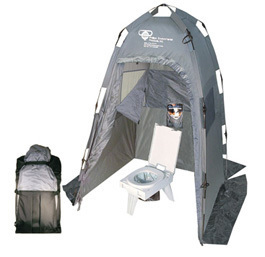 The PETT system is available at most camping-supply stores. For more information, check out the manufacturer’s Web site at www.thepett.com . Or better yet from a fellow OHV person, at: http://www.outbacktoilets.com/ On this site Bruce carries several different waste disposal systems starting as low as $ 15.00 for the solid cardboard system and in the $ 20.00 range for the TravelJohn™ systems and up to more for the ultimate PETT complete system at $ 249.00 He also discounts the systems heavily so we will purchase and use them! Be sure to check Walmart for these items as well, for possible lower prices. Other options include the “pickle bucket”, 5 gallon paint bucket or other large can used with kitty litter. There are seats that are put on the buckets. Start by pouring enough kitty litter into the container so it’s at least an inch deep. After going to the toilet, cover all waste with at least a half-inch of kitty litter. Leave at least an inch of room at the top so you can apply a final layer of kitty litter. Regardless of the container you use, make sure it has a tight-fitting lid. You don’t want the contents spilling out while you’re bouncing around the trails. Also, consider purchasing some pet deodorizer to apply after each trip to the toilet. A regular-size bottle or box should be sufficient for your needs. Check your favorite pet store or general merchandise store for options. Of course, you’ll need something to sit on, so pick up a toilet seat designed for outdoors use at any camping-supply store. They’re relatively inexpensive and last a long time. 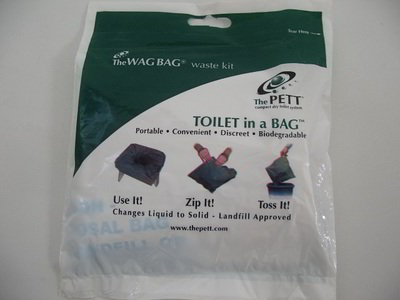 Whether you use the PETT system or some other method, make a point to properly take care of your human waste. Doing so will show others that we truly do care about protecting the environment. Plus by NOT leaving all of those tufts of white all over the area we are avoiding giving those who don't like us ammo. It doesn't matter a lot which system you use, but please use something more than a brown pile with a white "flag" on top. And pack it out !